Lithium stocks could continue rising as production increases, but it may come at the expense of potash producers. It could even bankrupt one investor favorite. The world has all the lithium it needs, but will struggle to ramp up supply quickly enough to keep pace with expected demand in the next five to 10 years. That promises to keep selling prices high in the near term, which will work to the benefit of lithium stocks such as Albemarle (NYSE:ALB) and SQM Industries (NYSE:SQM). That also explains why lithium producers are racing to bring additional capacity online. There's just one problem: The gain in lithium stocks is likely to create more pain for fertilizer stocks, specifically those with exposure to potash nutrients. That's not exactly what shareholders in top fertilizer companies want to hear, especially since the once formidable group of dividend stocks is treading water in a historic down cycle. But it's a real risk that has gone mostly unnoticed to date -- and it could significantly delay the long-awaited recovery for PotashCorp (NYSE:POT) and Intrepid Potash (NYSE:IPI). And these troubles could be just the beginning. When miners go looking for one natural resource, they usually pull up a basket of others. Natural gas is often found alongside petroleum.In fact, one-third of all platinum is mined as a byproduct of nickel mining. Gold, silver, copper, zinc, and lead often come from the same mine. The same is often true for lithium and potash. That's because close to 80% of the world's lithium is extracted from South American salt brines -- large bodies of very salty water -- along with industrially relevant quantities of various chemical compounds containing potassium, sodium, calcium, and magnesium. In fact, the most valuable lithium assets are those with high ratios of potassium to lithium. The production process isn't exactly the poster child of efficiency: Large volumes of liquid are diverted into open-air holding ponds, where over several months the sun gradually evaporates the water and leaves behind concentrated products. That concentrate is then processed to separate each component for additional revenue streams. After all, a lot of time and effort goes into the process. But the incentive for lithium producers to maximize value on their end as they race to fill the market's insatiable demand for lithium is awful news for potash companies. That's especially true considering much of the world's planned lithium production increases are expected in South American salt brines that contain large amounts of potash. Lithium and fertilizer companies have been closely intertwined for years behind the scenes, but the overlapping production will become increasingly more evident, perhaps painfully so. In the case of PotashCorp, perhaps awkwardly so. The company owns 32% of SQM Industries, one of the world's largest lithium producers. Albemarle, another of the world's largest lithium producers, also markets sizable amounts of potash pulled out of its lithium brine assets in Salar de Atacama, Chile. It currently reports this revenue stream in its lithium segment. While lithium stocks have already outperformed fertilizer stocks in the past three years, the gap may grow even larger in the years to come. Why? Salt brines don't just contain potash and lithium; they contain significantly more potash than lithium. How much more? While most major producers don't share their resource estimates, newcomer Advantage Lithium has been quick to point out its bountiful reserves in an effort to court investors. Better yet for our purposes, its prized asset is located in Cauchari, Argentina, and is directly adjacent to productive salt brines owned by Albemarle and Orocobre in the Lithium Triangle of South America. Advantage Lithium estimates that its Cauchari asset holds up to 470,000 metric tons of lithium carbonate and 1.62 million metric tons of potash. The lithium carbonate reserves are equivalent to about two and a half times annual global output of pure lithium metal (for now). Meanwhile, PotashCorp estimates that total potash production in North America during the first quarter of 2017 stood at 5 million metric tons. So 1.62 million metric tons of potash produced over the life of Advantage Lithium's salt brine may seem insignificant, but incremental sales of potash from all lithium producers will add up quickly. That's especially true with lithium production from Argentina alone expected to triple by 2019 -- and that's the low estimate. Excess production from overlooked sources could prolong slumping potash prices that are already at 10-year lows -- or, worse, it could make current prices the new normal. That would be disastrous for potash producers such as PotashCorp and Intrepid Potash, which are already fatigued from a multi-year battle with the current market rut. It could even spell the end of the latter. Intrepid Potash doesn't have too many options available outside of hoping for selling prices to recover. Management has moved to low-cost production methods (ironically, relying on solar evaporation ponds) and diluted shareholders to pay off debt. But selling prices for its Trio brand of products fell 37% from the first half of 2016 to the first half of this year. While the company cut its first half loss in half, it was still $20 million away from breaking even. The company is not well positioned to survive unforeseen competition from lithium producers, should the current environment continue on for the foreseeable future. The lithium and potash markets are on course for a slow motion collision before the end of the decade, but there will be only one winner in this zero-sum game. Given that it's the 21st century and batteries are essential to everyday life, that winner will undoubtedly be lithium producers -- at the painful expense of already struggling potash producers. Knowing that, I certainly wouldn't want to be holding any fertilizer stocks in my portfolio that are heavily exposed to potash. 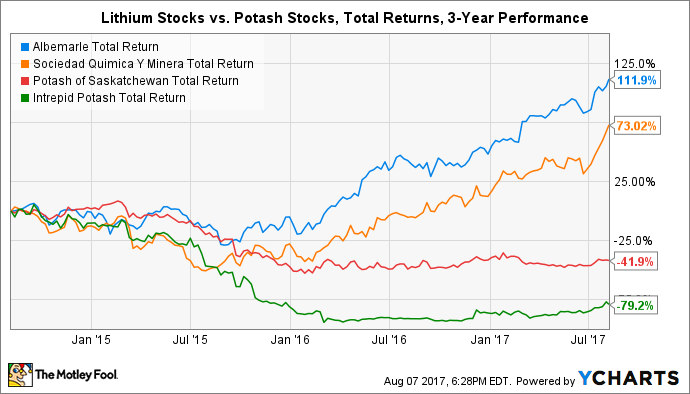 Investors betting on a recovery or chasing potash producers for their high dividend yields should consider that the pain in recent years may be far from over.